Do you like wasabi? For many years, I only knew it as this horrible green paste that comes with sushi and that (in my opinion) kills any other flavor that you would try and taste at the same time. I never really understood how wasabi can go together with something delicate as sushi. I decided that long time ago, and never really tried wasabi again. Until one afternoon, I sat at a Filipino friend's house and we ate wasabi peas. Did you ever try wasabi peas? Addictive is an understatement. Crunchy like roasted nuts, but so much lighter. The wasabi works perfectly with the slight sweetness of the peas. I didn't check the ingredients list of these commercially available wasabi peas. But when I did, I was sad to see that these were no good: vegetable oil, artificial flavors, and the likes. Fast forward a few years, I try and make wasabi peas myself. It took me a couple of weeks to get it right: 1. peas don't work as they shrivel to close to nothing when roasted for an hour. 2 edamame do not need to be boiled or steamed before roasting. It's just extra liquid that you have to get out later when trying to get them dry and crispy. 3. A little coating of oil helps the wasabi stick to the beans 4. Leave them in the oven until they are completely dried out and crispy, even if it takes 90 minutes. You will not regret it. It's my husband's new favorite snack. He never liked wasabi either before. But these are addictive. I promise! Preheat oven to 175C/350F. Line baking sheet with parchment paper. In a small bowl, combine salt, wasabi and sesame. Set aside. Thaw frozen edamame if using, under hot running water. Pat dry with paper towels. In bowl, combine edamame beans and oil. Stir until evenly coated. Add the wasabi mixture and stir until evenly combined. 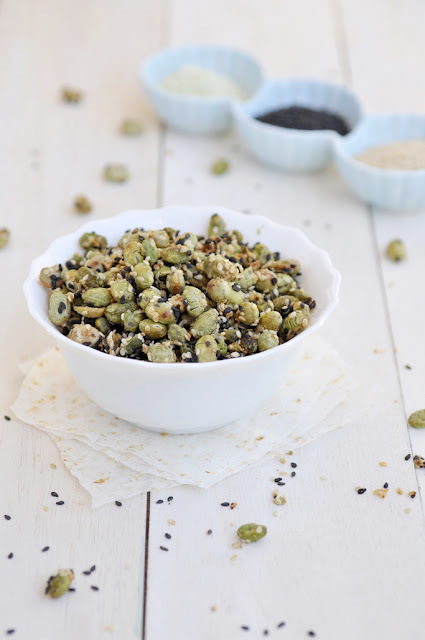 Spread the edamame in a single layer on the baking sheet. Roast for 1 hour or up to 1 hour 20 minutes. Turn over the edamame a couple of times. They are done when completely dry and crispy.